But, not just any old Syrah. It has to be well made – and this one is. Alban Vineyards is located in Edna Valley – close to San Luis Obispo – down the California coast from Monterey and Carmel and north of Santa Barbara. Alban Vineyards isn’t certified biodynamic or organic, but they’re careful with the land, and this translates to the quality of their wines – the fruit and flavours are pristine. Instead of spraying herbicides, they have a herd of sheep that roam the vineyards between harvest and bud break eating the grasses and weeds. They don’t receive supplemental feed, so they’re very focused on keeping the ground around and between the vines clean and trimmed. When the grapes ripen and closer to harvest, the sheep are removed and a drone is used with predatory bird calls to keep those birds and animals that would otherwise feast on the grapes away. And, because of the drone, they don’t use a tractor, so there is no soil compaction – also great for the vines and the grapes. These efforts have paid off – this wine is gorgeous. Deep and inky purple on the eyes, the nose is intense black cherry with cedar, black licorice, blue fruit and a blush of violet thrown in for good measure. The palate is dry with plush tannins and flavours of purple plum, blueberry and cassis, Dutch licorice, more cedar frond, black pepper, and slender leather belt. With its long finish, it’s intensely delicious – and not hot at all, despite the high alcohol. WSET Very Good Plus and a must find. I got this bottle at @BirdRockFineWines in La Jolla. 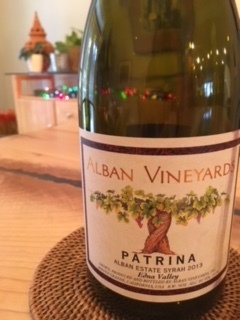 This entry was posted in California, OTHER, RED, Shiraz / Syrah and tagged 2013, Alban Vineyards, california, Edna Valley, Patrina, red wine, syrah. Bookmark the permalink.